The Battlin’ Bears football team returned home for two weeks after a 20-7 victory in Caldwell Idaho against the College of Idaho Coyotes. Head coach Jason Petrino and his football team were poised for a signature win against powerhouse opponent Southern Oregon. The Bears went up early and led the Raiders 34-14 in the third quarter. However, the former national champions were not fazed, and erased the 20-point deficit. Southern Oregon quarterback Jack Singler threw two touchdowns, one for 73 yards and one for 66 yards, along with a 51-yard breakaway run by Sean Tow. The Raiders were brought back in the game leading the Bears 35-34. Rocky would not be able to respond to the Southern Oregon comeback. In football there is no consolation prize, but the Battlin’ Bears still played exceptionally well against a top-ranked opponent. Senior quarterback Chase White finished 24 of 31 for 251 yards, Junior wide receiver Prince Shanola caught four passes for 111 yards, and senior running back Kodee Varner rushed for 115 yards on 24 carries. The defense scored a touchdown as well with senior linebacker Jason Baker returning an interception for 22 yards. Sam Sparks returned a kickoff for 93 yards and brought life back to the Battlin’ Bears sideline as they took the lead with six minutes of play left in the game. Sophomore quarterback Jacob Bakken stepped in for White, who was injured earlier in the game. Bakken hauled in a 56 yard run on the read option to close out the game with the final score of 21-13. The football team traveled to Helena this past weekend to take on the Carroll College Saints for a conference rematch. The Saints came out on top this time, defeating the Battlin’ Bears 28-14. Rocky struggled after losing a few key players since the last victory over Carroll at home. Jacob Bakken started at quarterback, as White sat out the game due to a shoulder injury from the previous game against MSU-Northern. Bakken had 22 completions out of 42 pass attempts and had 174 total passing yards, he rushed for one touchdown. Taylor Schwartzwould also rushed for a 28 yard touchdown. 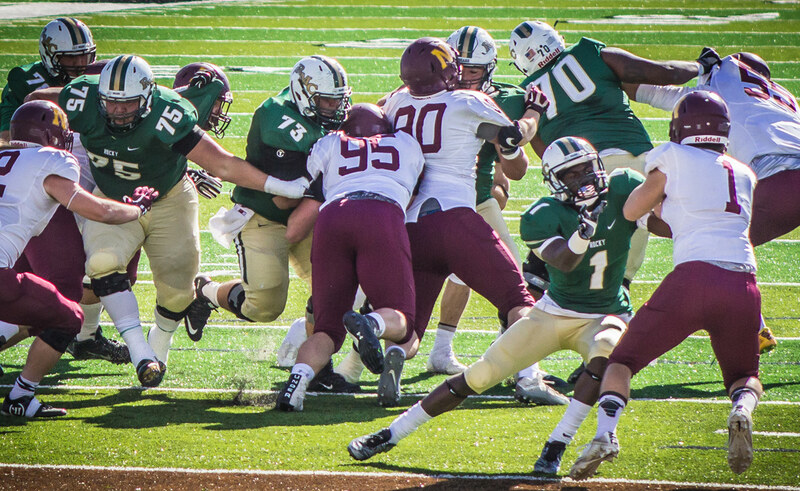 The Battlin’ Bears return home Saturday, October 29th for another rematch, this time against Montana Tech. The Bears will look for an upset win over the top-ranked team in the Frontier Conference.